Hardly anything makes Québec as likeable as the mix of French and English that you come across everywhere. “Our address is Chemin Moe’s River,” writes François, the owner of the restaurant Le Bocage in an e-mail that should not be shown to the members of the Académie Française. The road to François leads into the rolling hills of the Eastern Townships, a series of small towns about two hours east of Montreal. The ubiquitous mixture of languages is a legacy of lengthy arguments between the somewhat stubborn, French-speaking Québécois and the predominantly British-influenced rest of Canada. In the end, Québec secured extensive autonomy: instead of Moe’s River “Road”, they say “Chemin”. And perhaps this individualism is also the reason why Québec has become home to many individualists. The Eastern Townships are predominated by forests, repeatedly interrupted by pastures and meadows, and by small villages that nestle on rivers and streams. Here, halfway between Montreal and the provincial capital Ville de Québec, François bought a villa that was built in 1825. For 17 years he has been running a bed and breakfast with rooms full of knickknack, which on the one hand rustically emphasise the age of the house – including flowered wallpaper. On the other hand it ironically breaks when an antique chair dangles upside down from the ceiling. In the in-house restaurant, that is also open to outside diners, François, who actually is a chef, cooks the meals. “Since the 1980s there has been a movement in the area that values regional products and eating with conscience,” he says. A tradition that François follows, albeit without dogmatism. “We try to use as many regional products as possible and cooperate with suppliers from the region. But we want to maintain the flexibility to also offer non-regional products.” The result is homemade, inspired cuisine at the highest level: for example wild mushrooms from the region combined with a mild curry sauce or beetroot with pink peppercorns and butternut squash refined with a touch of maple syrup. “I get inspired every day, see a recipe somewhere and develop it further,” explains François. François feels at home in the country, also thanks to the tolerant Canadian society. Living here as a gay is not a problem, he says. In fact, Canada – and within Canada especially Québec – is one of the most advanced and tolerant countries in the world. 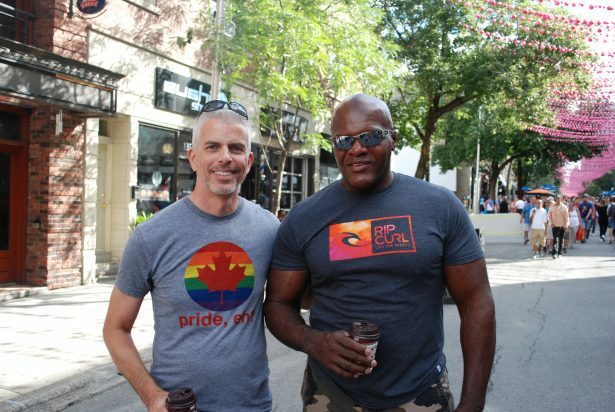 “Québec has always been a leader in LGBT rights,” says homo activist Olivier Poulin, who organised the Pride in Québec City until 2014. “An anti-discrimination law was passed as early as 1977, which was very early by international standards.” Besides Québec City the gay scene with its parties, bars and clubs concentrates in Montréal. Also in the countryside one you don’t have to fear discrimination in everyday life and can instead enjoy the gentle landscape of the Eastern Townships, e.g. 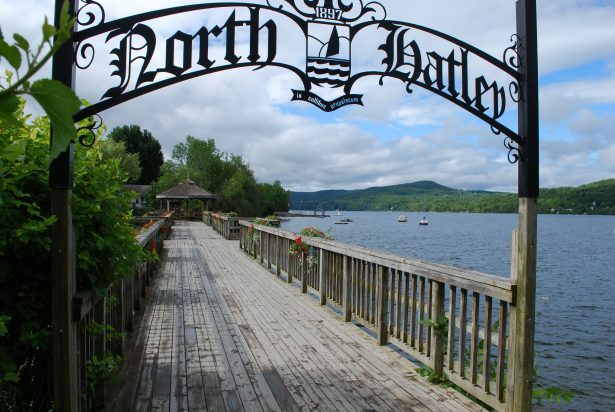 in the villages of North Hatley and Magog. They nestle on irregularly shaped lakes surrounded by wooded hills. Or you can drive to Baie-Saint-Paul, about 350 kilometres northeast of the Saint Lawrence River. Nonconformists have created a small utopia here. The artist town of almost 8,000 inhabitants even has its own museum of modern art, in which director Jacques Saint-Gelais-Tremblay organises an Andy Warhol exhibition. And on the main street Rue Saint-Anne, galleries and studios line up, with cafés and restaurants in between in the small, low houses. Many are run by gays and lesbians. David has also deliberately moved to the Canadian province. 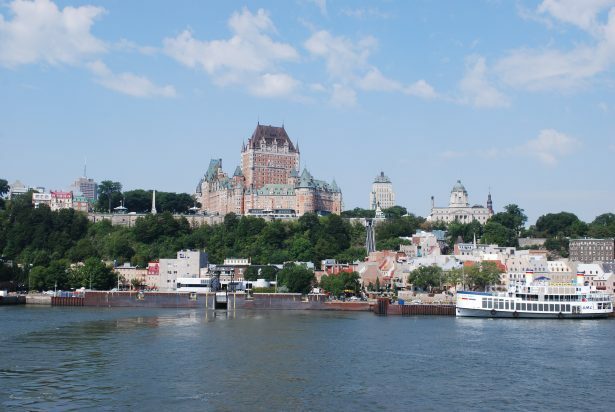 The 30-year-old is actually from Philadelphia, but longed for a more open and freer atmosphere when he knew from his home country – and found it in Québec. 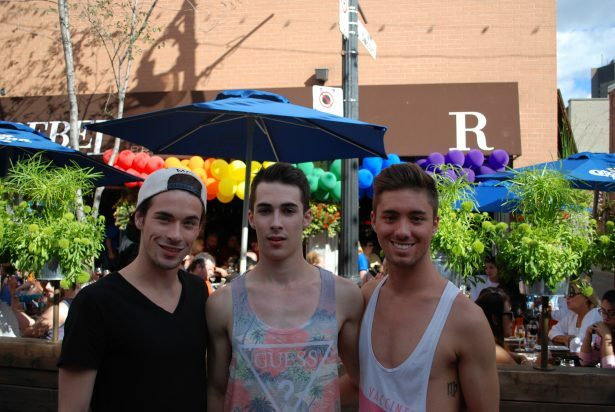 Together with his Canadian boyfriend, he was looking for a place where they would feel comfortable together. Five years ago, they opened a Bed and Breakfast in Baie-Saint-Paul – and have since then renounced the seemingly indispensable but often stressful luxury of civilisation. David only uses the Internet to contact his guests, his phone is connected to a landline. But he knows the area like the back of his hand and can recommend beaches and wild and romantic mountain streams. Almost all guests drive from Baie-Saint-Paul northeast towards Tadoussac, a busy starting point for whale watching. Early in the morning the place still very quiet. The fog hovers above the bay and the small harbour, but the land is already warming in the sun. The white houses with their bright red roofs are illuminated by the sun. Dense wafts of mist pass a small chapel on a hill by the harbour and leave a damp feeling on your face. 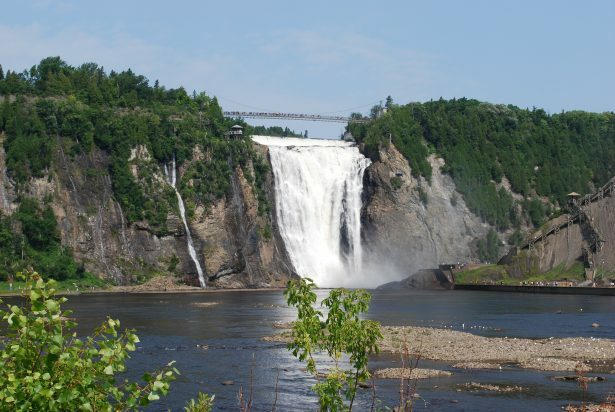 The fresh water of the Saint Lawrence River and the river Saguenay merge here and then mix with the saltwater of the Atlantic Ocean. For krill, the whales’ staple diet, living conditions here are just perfect. The normally migratory white whales have thus given up their restless journey from hunting ground to hunting ground. Ignoring the normal behaviour of their species – they stay here all year round, they are nonconformists, too. And quite honestly: One who sits outside the small chapel, feels fog and sun on his skin simulatneously, then goes for an excellent slow food lunch and listens to the friendly mix of French and English – who wouldn’t want to stay simple? 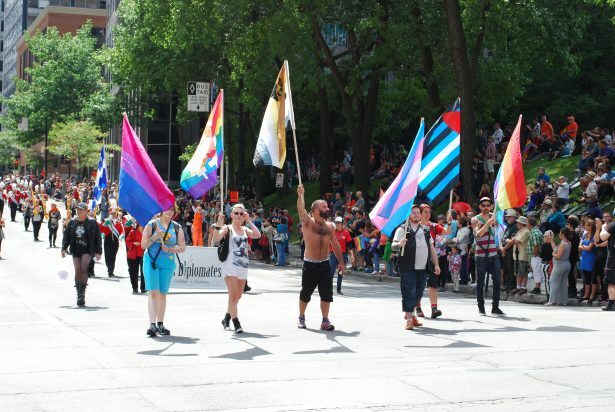 Montréal celebrates its Pride 2016 from August 8th to 14th, Québec its Pride from September 1st to 4th.